Yet another post congratulating Rod on a yet another BR (for the 4 mins) - stunning maestro keep em coming and I'll keep the fanfare going... Indeed a pretty tidy 10k as well - good luck with going sub 37 (sounds like an insane target to me)! Great to hear the recovery has got to the point where you can consider getting back in the gym Susan - amazing. Don't push it too hard...but deffo give it a go - in moderation its got to help speed stuff up. Largely back on target for me this last few days. 11/9 8x500r3:30. A while back I managed 7 in the low 1:40.x and a faster last for a 1:39.9 avg. Ever since when this session comes up I go for all 8 at 1:39.9 and I've not yet made it. Tonight managed 6 @ 1:39.8/9/8/8/9/9 but was hurting badly so then 1:44.9 and 1:42.7 to finish for a 1:40.8 avg...I'll try again next time! 14/9 Inspired by Rod I had a go at the 4mins for the IRL tonight. Last year I managed 1197m and spotted a gap in the record books to claim the BR for a few weeks. Quite rightly Richard S let it be known that he had set the bar considerably higher a few years back and my tenure of the pedestal was somewhat short lived! My best ever in my early 50s was a 1220 and nowadays my aspiration is to get back to 1200. I'm still not quite there, but managed to eek out one more meter this year for an 1198 so I have to be happy with that. In fact I was quite tired today so I may give it another go if I get the chance on a day I'm feeling fresher, just to see if I can find another half second. I'll have to give it time to forget the pain first though! Mike - best wishes for nailing the 8 x 500 r3:30 all sub 1:40 pace. Well done on beating last years 4 minute challenge by 1m and nearly a fortnight left to improve on it. Rod - superb 10k LWT PB. Me - short session in the gym today. Walking on treadmill, cycling and stepping. More physio tomorrow. Thanks Susan I'm still edging very slowly to better scores so hopefully it will continue. Well done yourself on keeping the recovery ticking along. 15/9 AWL Pyramid. Did this with a less variable pace than normal and didn't slow as much for the longer reps. As a result did the 8.1k in 29:16.0 @ 1:48.4 which is a recent best. 16/9 5x2k r2. Just a filler session so tried to hit some numbers. 7:47.3 (0.1 fast); 7:47.4; 7:55.8 (0.1 slow); 8:08.0; 8:08.0 spot on! 18/9 Sub7 ITC 1k. I was a bit disappointed not to better my last years time when I tried this earlier in the month. Today I only did 90 mins strenuous activity and spent the rest of the day at my desk. That coupled with a lack of time meant it was the right time to have another go. Glad I did! Only less than a second better...but that's much better! I'm 61 today so....I had to earn the mountain of cake I'm going to scoff! 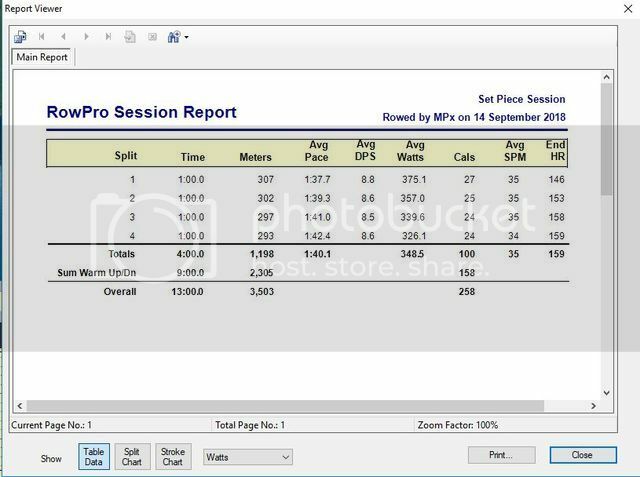 This improves my British 60-69 Lightweight record by 41 metres (0.3 on average pace) so where's those creamy chocolate goodies! Susan.........................Thank you for the kind Birthday wishes,much appreciated m'dear! Rod is that actual average HR or what the PM (incorrectly) chucks out ???? Are you sure you're not aging backwards? The only good news about it is that I'm in decent enough form to think it wasn't very fast! I suppose it it will do given that I've only just started to sharpen up but much better to come....I hope! More stunning workouts Rod. Many congrats on the latest BR for the hour and that 5k is far from shabby despite your protests. Lovin it - keep 'em coming matey! 20/9 Dumbbells and 30 mins varipace for 7617m @ 1:58.1 avg (upped my pace slightly from normal to see if I can sustain it for these sessions). 22/9 Had very little time so should have missed the session and had a rest day, but couldn't resist putting up another 4mins to see what happened. What happened was my legs were dead from the 5K the day before so after about 2min30 (750ish m) on sub 1:40 target I completely caved in and slowly paddled in (@over 2:00 pace) for just a 1111m score. 24/9 16x250 r90 Target was all sub 48s (<1:36pace). Managed 4x 47.9 (1:35.8); 9x 47.8 (1:35.6); 2x 47.7 (1:35.4); and 47.3 (1:34.6) for the last. Best yet...but recovery feels like its going to take some time. That hurt! The best way to see what your current 2k potential is...is to do a 2k! I suppose as a 61 year old Lightweight I should be happy just to be under 7 minutes...but as usual...I ain't! I've only just started to do faster training after a lot of endurance work so expect this to come down by quite a bit yet...well I hope it does anyway! At the end of the last split my HR was 199...which is a new PB....so I suppose I should be happy with that! Mike...........Nice session of 250's....I could do with some of that speed....I'm a bit blunt at the moment! This was a new session so I started cautiously. I didn't feel too bad and sped up as it went along ending up averaging my recent 2k pace so happy enough. I'll be trying to work this one down over the next few weeks as the British Champs gets nearer. Mike - Great work on the 5 x 2k r2 to be so close to what you intended, and to shave some 10ths off the Sub7 1k. 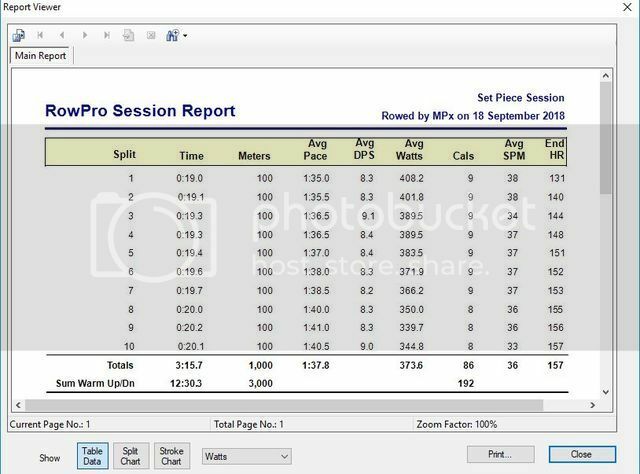 Looks like a new target for the 30 mins varipace now and congratulations on the 16 x 250 r90 secs best. Rod – nice one, improving the hour of power British 60-69 LWT record that you already hold. Your HR and SPM are amazing for such a long piece. Well done on your 5k TT too. I believe your Sub7 mins 2k is only .2 off what you achieved in the World Champs in Feb – wow, and still 8 weeks to the Welsh IRC. Me - now 6 weeks postop. Can do slow walking on the treadmill and bike up to 20 mins each, as well as occasional exercise classes. Starting back to work on Wednesday. Still LWT, and although it will probably be 2019 before I am on the ergo again, I am trying to stay a skinny. I can already walk with a crutch for a mile, but want to be going without it by November. Most of my exercise is Monday and Friday, so feeling a bit stiff tonight, but will start to introduce a 3rd weekly visit to the gym soon. PS I get invited to the craziest events – shame I am not fit enough to consider them . If anyone wants to know about an ergomarathon, (1-4 person team with set amounts of shared distance for the 2 and 4 person teams) March 3 2019 in Hamburg or the 100k solo/duo event on 13 April 2019 at same venue I will pass the details on. Good to hear that you've kept up with the rehab Susan and there's a bit more progress every report...keep it going and you'll be back to normal asap. 26/9 Dumbbells and 30@20. Was tired at the start so target was steady 2:02.0 all through. Managed it spot on, but clearly lost focus near the end as I was looking to come in with 7373m but actually did 7376m for some reason! 27/9 3x2k r2 Last time avg was 1:52.4. Managed 1:52.3; 1:52.3; 1:51.2 for a 1:51.9 avg which is a recent best. 2/10 2kTT. Target was steady 1:44 pace. Managed a gentle positive split from 1:43.9 to 1:44.9 for a 6:57.2 which is my recent best and first sub7 as a 61 year old. Happy days! I was knackered by then! Now back to the longer stuff....I'm too old for all this excitement! Susan............Great to hear you're progressing nicely. Good news that you'll be back at work soon and chucking the crutch away! Mike..................Terrific 2k me ol' mate well done! My 10 x 500 is a 2k pace session, the idea is to get the pace down...and the 2k time with it! This was 0.5 on average pace faster than my best for this session last season so hopefully that points to a faster 2k this season....I'll find that out soon I guess.